Craig “The Professor” Pumphrey and Paul “The Human Bulldozer” Pumphrey, also known as “The Pumphrey Brothers”, are world-champion professional breakers, Martial Arts experts, Guinness World Record holders and all around gifted athletes from Indiana. The dynamic duo is best known for their feats of raw strength: Dismantling cars, planes, office buildings, hotels and more using their bodies and bare hands to prove anything is possible. Craig and Paul Pumphrey traveled the United States for TruTV with a Guinness Book of World Records judge searching for the next record holder in Breaking It Big. The Pumphrey Brothers have been featured on multiple television and radio programs all over the world. Getting their television start on Guinness Prime Time, their career has grown into several television specials and two seasons of their own TV series, Human Wrecking Balls on G4. 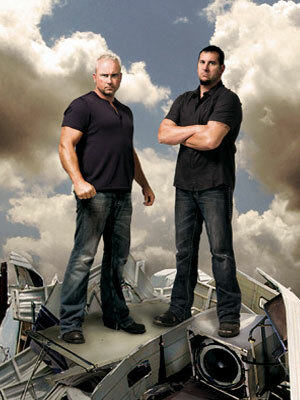 Both Craig and Paul also know their way around the construction world. For 10 years, Craig worked in commercial, residential building, industrial roofing and fire & storm restoration. Often times when things don't work the way they should, Craig has no issues "improvising". Paul started his construction career in 1993 when he started building custom and spec homes in Southern Indiana. He is also an expert in re-models and additions. Paul has been part of the National Homebuilders Association, Indiana Home Builders Association, Certified Firestone Red Shield Installer and Hardy Certified Installer. So, whether it's a new build or a demolish and re-build, Paul has it covered with over 20 years of experience and know-how. Craig and Paul also excel in survival skills. With hunting, fishing and trapping as a hobby, both Craig and Paul are more than capable of making it on the "outside" with whatever is available to them. They are equipped to build shelter, tools, weapons or anything else with their hands on land, sand or water utilizing their surroundings. Both the guys are very familiar with firearms of evey type, from black powder to small caliber hand guns to rifles, shotguns to full automatics. Yep, drop these men in an urban environment or in the woods and as the song goes "A country boy can survive".